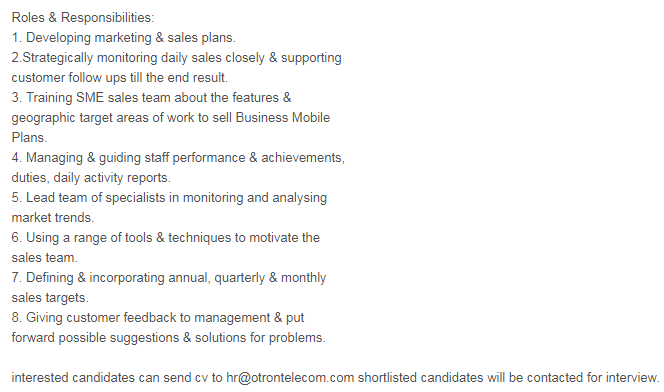 BUSINESS DEVELOPMENT MANAGER Job is available with Company in United Arab Emirates, Dubai. It is a Senior Level level role. This applicant should be Bachelor Degree qualified for this position. This job will expire on 01 March 2019. This job involves skills like Management, Marketing, Sales, Training, Techniques, Feedback, Mobile, Business, Solution, Support and Monitoring. Experience required is 2 years. Management, Marketing, Sales, Training, Techniques, Feedback, Mobile, Business, Solution, Support and Monitoring.